Clovis Crawfish and his pals return in another adventure on the Louisiana bayou. This time, Simone Spider threatens the peaceful region by building her silver web near Clovis’s mud house. The bayou friends watch helplessly as Simone puts the finishing touches on her sticky web. Two great adventures starring Clovis Crawfish and friends! On side one Clovis Crawfish and his pals return for another adventure on the Louisiana bayou in Clovis Crawfish and the Spinning Spider. Simone Spider threatens the peaceful region by building her silver web right by Clovis’s mud house. The bayou friends watch helplessly as Simone puts the finishing touches on her sticky web. In the adventure of Clovis Crawfish and the Curious Crapaud on side two, nature plays its mysterious games and Clovis and his friends learn to appreciate it and each other a little better. Corinne Crapaud is Frenand Frog’s shy cousin. She can only say a few words, and they’re all question words. “Qui?” (Who? ), “Quoi?” (What? ), and “Pourquoi?” (Why?) are three of her favorites. Clovis Crawfish and his pals return for another adventure on the Louisiana bayou in this story, told in both French and English. In Clovis Crawfish and the Spinning Spider, Simone Spider threatens the peaceful region by building her silver web near Clovis’s mud house. When little Josette June Bug comes to the bayou, she gets tangled in the lair. In the adventure of Clovis Crawfish and the Curious Crapaud, Clovis and his friends learn to appreciate each other a little better. Corinne Crapaud is Fernand Frog’s shy cousin. It’s spring again in south Louisiana. The birds are chirping from their perches on the branches of the moss-covered oaks. The dragonflies are darting over the marsh, and Clovis Crawfish is watching over the bayou as M’sieu Blue Jay searches for a tasty acorn treat. It’s a lazy spring day in the bayou—until Lizette Lizard begs Clovis for his help in searching for her twin sister Lois. Each cassette contains two fun and educational lessons, as well as a short song in Cajun French. On side one, a big bétail (big animal) intrudes into the swampland on a gloomy day, and the bayou critters are fearful. On side two, a group of bayou animals hurries to see the baby blue jay who has fallen from his nest during a storm. Clovis Crawfish and his friends share two adventures on this bilingual CD; tracks include French and English translations. Michelle Mantis, an ugly old insect with an enormous appetite, visits the swamp home of Clovis and his friends, and her voracious appetite alarms Clovis’s friends.Etienne Escargot makes his way through the bayou country to live with Clovis and the bayou friends. Before reaching Clovis’s home, Etienne releases his eggs, forming a pile of tiny pearly shells. Poo-yi! There is nothing more foul than the smell of a skunk, except for the harsh words of teasing children. In this twelfth book of the Clovis Crawfish series, Mary Alice Fontenot has created a delightful story to teach children that people who are different from themselves are special in their own way, too. Hardcover. Poo-yi! There is nothing more foul than the smell of a skunk, except for the harsh words of teasing children. 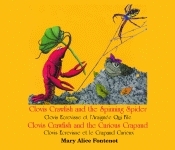 In this twelfth book of the Clovis Crawfish series, Mary Alice Fontenot has created a delightful story to teach children that people who are different from themselves are special in their own way, too. Audiocassette. Clovis and his friends find that things are not always what they first appear—especially when it comes to moving cypress knees! On closer inspection, Clovis, Lizette Lizard, René Rainfrog, and Bertile Butterfly find a turtle, a different kind of turtle from Theodore Turtle, but a turtle nonetheless. Since his real name, Abraham Buckingham Calhoun, is a little cumbersome, they dub him Bidon Box Turtle. All the friends step up to make his acquaintance. Hardcover. On side one, Clovis and his friends must help Bidon Box Turtle, a Mississippi land turtle, cross the bayou without getting his hat wet! “Kuk-kuk-kwak-kuk-kwak-kuk!” What could possibly make a sound like that in the Louisiana bayou? Find out on side two. Whatever it is, it wakes up Clovis Crawfish from a long nap. Whatever it is, it frightens his friends, Christophe Cricket, Lizette Lizard, and René Rainfrog. Audiocassette. In this story of courage and friendship, set on the Louisiana bayou, Clovis Crawfish and his friends teach children how to put aside their fears and assist others, while also teaching them a bit of Cajun French. Clovis Crawfish and all his friends return in a new bayou tale. Charlotte Cheval, an ugly old insect with an enormous appetite, visits the swamp home of Clovis and his friends. Etienne Escargot makes his way through the bayou country to live with Clovis and the bayou friends. Before reaching Clovis’ home, Etienne releases his eggs, forming a pile of tiny pearly shells. Audiocassette. Clovis Crawfish and his pals return in another adventure on the Louisiana bayou. Clovis Ecrevisse et l’Araignée Qui File presents Clovis Crawfish and the Spinning Spider in French with Cajun dialogue. In this volume of the series, Simone Spider threatens the peaceful region by building her silver web right by Clovis’s mud house. The bayou friends watch helplessly as Simone puts the finishing touches on her sticky web. In the adventure of Clovis Ecrevisse et le Crapaud Curieux, or Clovis Crawfish and the Curious Crapaud, nature plays its mysterious games and Clovis and his friends learn to appreciate it and each other a little better. Corinne Crapaud is Frenand Frog’s shy cousin. She can only say a few words, and they’re all question words. “Qui?” (Who? ), “Quoi?” (What? ), and “Pourquoi?” (Why?) are three of her favorites. Audiocassette. When a big bétail (big animal) intrudes into the swampland on a gloomy day, the bayou critters are fearful. The big bétail is Andrew Armadillo from Texas. A huge creature with a hard shell, cowboy boots, and thick-lensed spectacles, Andrew at first frightens our bayou friends with his strange accent and booming voice.